The United States Congress designated the Mark O. Hatfield Wilderness (map) in 1984 and it now has a total of 65,436 acres. All of this wilderness is located in Oregon and is managed by the Forest Service. Known as the Columbia Gorge Recreation Area prior to Wilderness designation, this area lies just south of the sheer cliffs of the Columbia River Gorge. Most of the land adjacent to the river and along Interstate 84 is privately owned and often developed and, of course, outside the Wilderness boundary. The breaks of the gorge are spectacular basalt cliffs, rocky slopes, and rock outcroppings. Rugged and steep, the slopes of the Wilderness rise to a slightly uneven plateau and on to mountain peaks, talus slopes, and lakes with elevations ranging from approximately 100 feet near the river to 4,900 feet on Mount Defiance. Sparkling waterfalls and mossy-green cliff faces often highlight the deep drainages slashing through the broad, flat ridge tops. The main waterways--Herman Creek, Eagle Creek, and Tanner Creek--flow north toward the river, supporting borders of western hemlock and fir. Most of the 200 miles of trails follow drainages. Approximately 14 miles of the Pacific Crest Trail and the Eagle Creek Trail receive the most use. The Eagle Creek Trail, with seven waterfalls, a tunnel, and designated campsites, can be hiked in a 16-mile-plus loop that hurdles Tanner Butte. Its proximity to Portland translates into lots of people. 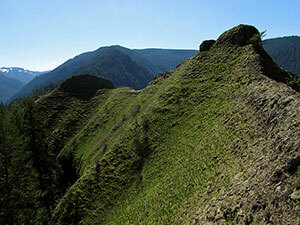 If you require solitude, take one of the quieter trails; Tanner Butte, Herman Creek, and Nick Eaton Ridge. Each of these is approximately 10 to 12 miles round-trip. Planning to Visit the Mark O. Hatfield Wilderness? How to follow the seven standard Leave No Trace principles differs in different parts of the country (desert vs. Rocky Mountains). Click on any of the principles listed below to learn more about how they apply in the Mark O. Hatfield Wilderness.